Geophysical research needs to continue to forge ahead to ensure that the acquisition, processing and imaging of seismic data reveals the maximum amount of information to facilitate the understanding of the sub-surface for resource extraction, ground water management, carbon storage and sequestration. The Barrett Unconventional model includes the characterization of finely laminated and fractured shale reservoirs by their full seismic anisotropy. Geobodies like this represent sweet spots in shale layers based on Eagle Ford and Woodford Formations of Oklahoma and Texas. Image credit: SEAM. The SEG Advanced Modeling Corporation (SEAM) was established in 2007 as a conduit to facilitate inter-company collaboration by working on projects too daunting and expensive for any one company. The SEAM projects so far have worked on large-scale, leading edge model building and numerical modeling. The resulting datasets are constructed around problems of importance to the resource-extraction industry and serve as research tools, benchmarks and educational tools. SEAM provides opportunities for companies to share the high cost of substantial model design, generation and data simulation. Participant companies can address large-scale modeling issues at a fraction of the cost of companies doing this alone, thus giving a substantial boost to advancing the art of modeling and computation. SEAM projects typically are conducted in phases, each lasting approximately two to three years, by an industry consortium assembled around a geophysical challenge of great current relevance. The technical detail of the project work is directed by the participating companies, while SEAM provides logistical support by handling financial and legal matters as well as the long-term preservation and storage of data. It is important that these results are accessible to the wider research and extractive industry so, after an initial two years of confidentiality, they enter the public domain. SEAM projects thus provide the geophysical exploration and training community with model data at a level of complexity and size that cannot be funded or computed by any single company or organization. One of SEAM’s primary objectives is to design and generate synthetic models of 2D and 3D seismic data. 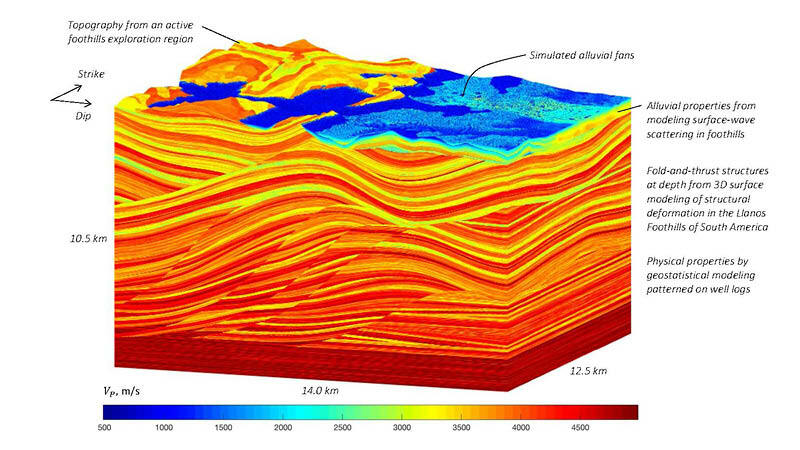 One of the first issues tackled, in SEAM Phase I in 2007, was subsalt imaging in Tertiary basins. This entailed the construction of the SEAM Earth Model with the simulation of approximately 65,000 shot records, containing as many as 450,000 traces each for an acoustic dataset. Although this was representative of a 60-block area of the deepwater Gulf of Mexico, it was developed in a form that easily enables extension to other complex imaging challenges by adding the rock properties necessary for elastic, nonseismic, anisotropic and viscoelastic. The project was considered a resounding success, with data from it being used for a number of presentations at the 2011 SEG Annual Meeting. 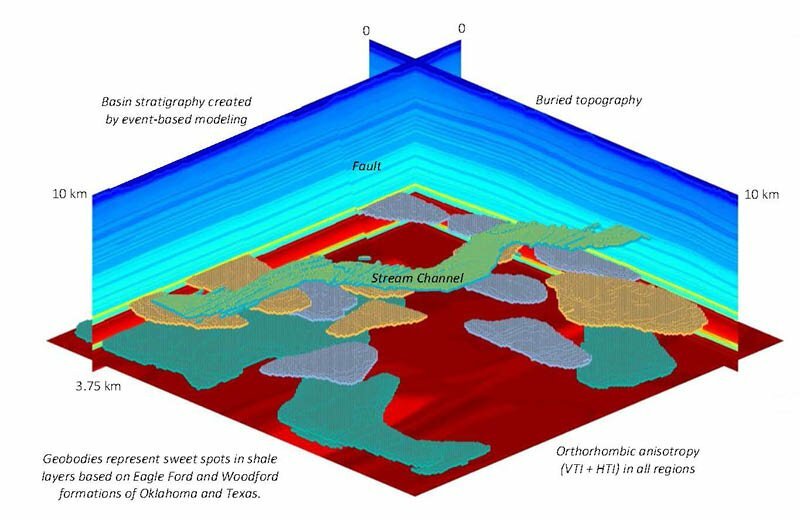 The Phase II Arid model focused on features present in arid or desert environments and models karst structures and the extreme contrasts between unconsolidated near-surface sediments and bedrock, which often obscure deeper imaging targets. Image credit: SEAM. This was followed by Phase II, which ran from 2011 to 2016 and looked at the specific challenges in the exploration and characterization of petroleum reservoirs on land. For this, three models were built: the Barrett Unconventional model, which focused on features of unconventional hydrocarbon reservoirs; the Arid model, looking at desert environments; and the Foothills model, focusing on features of mountainous regions. Phase II was a collaboration of 22 oil and oilfield service companies and more than 100,000 seismic shots were simulated over the three SEAM land models. For the SEAM Foothills Model the complete wavefield was recorded at a dense array of three component receivers to test data interpolation and extrapolation algorithms in regions of rapidly varying and sharp topography, with alluvial fill at the surface and deep complex structures caused by compressive fold and thrust tectonics. Image credit: SEAM. Ongoing projects include a study to evaluate and advance current methodologies for pre-drill pressure prediction and hazard avoidance through improved seismic imaging. While this project has concentrated on predicting pore pressure using surface seismic and EM data, a separately funded pilot (TimeLapse) looked at 4D pressure prediction, focusing on understanding the evolution of pore pressure during production using time-lapse seismic data and reservoir characterization. This represents a significant advancement in the state of the art of geophysical numerical modeling by proving that time-lapse seismic for reservoir monitoring can be successfully simulated. This opens the door for using synthetic data to address problems and explore solutions for reservoir characterization during the life of the field. The most recent SEAM project, which commenced late in 2015, looks at Life of Field workflows, including simulations of reservoir dynamics based on a realistic production scenario using complex geology, reservoir description and seismic data. The simulations will help participants to understand the value (or lack of value) of frequent 4D re-shoots. Building on the success of the modeling projects, SEAM is currently working to establish new projects to collaboratively advance the technology in areas of common interests. Two projects under consideration would look at issues around Full Waveform Inversion and at Artificial Intelligence. Both projects would expand collaboration beyond model building and data generation. They are scheduled for launch in early 2019. The primary goals of SEAM are to provide a forum to discuss geophysical problems of interest and to advance the art of modeling and computation, while accelerating the pace of innovation and maintaining a constant stream of research activity. Progress in the 11 years since its inception suggest that it would appear to be successfully achieving those aims. Participants are very satisfied with the project and its results, with seismic companies, for example, saying that they see tremendous value in testing survey design methods and forward modeling and depth imaging algorithms, particularly taking advantage of the diverse experience of the contributors. One of the most important aims of SEAM is to ensure that the data and learning gained through the projects is available to the wider industry, in order to provide vital benchmarking tools, as well as material to help educate the next generation of seismic processing and image experts. Therefore, small proprietary datasets are available free of charge to advance research and innovation in geophysics. These include 2D datasets from SEAM Phase I and samples of the model and other material from the Time Lapse project. These data can be downloaded from the SEG website, where, for a fee, the full datasets of all the SEAM projects are also available.